It's cold and raining cats and dogs in LA today so I'm finally forced to tame my usual nature to be out and about. At last, I am enjoying some quiet time in my new home in Culver City (thank goodness!) and reading one of my favorite genres: cookbooks! As I'm perusing my new copy of Rose's Heavenly Cakes, I realized that I've badly neglected this blog between the holidays and moving houses. I've got a huge backlog of delicious food to write about but I'm craving something hot and hearty, a comfort food that would warm me from head to toe with just one bite on this cold, rainy day. 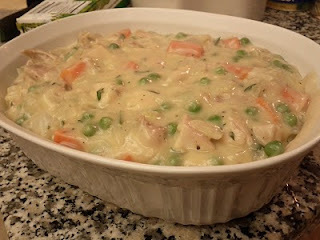 So, I present you chicken pot pie. 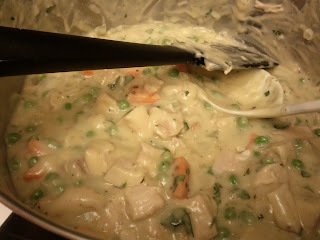 The boyfriend was craving chicken pot pie a few months ago when it was really cold. I didn't know where to go for pot pie and he loved Marie Callender's chicken pot pies. Normally, I just went to Marie's for dessert pies and I didn't have much confidence in Marie's other dining options but I kept an open mind. The verdict? If you're lazy and desperate, then Marie's pot pie will suffice; otherwise, I would not recommend it. 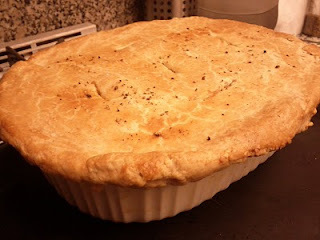 After tasting that bland and chicken-less pot pie, I vowed to make a chicken pot pie that would wow Dan and forever wean him from Marie's pot pie. After much Googling and scouring my cookbooks, I decided to make Ina Garten's Chicken Pot Pie because her recipe calls for a good ratio of chicken and vegetables. It's also worth making your own pie crust. Garten's shortening and butter crust was amazingly flaky and while there's some chopping and dicing work involved, the overall recipe was easy to understand and follow. Making the filling. There's a lot of chicken and veggies in this recipe and the sauce is creamy and delicious. I didn't have four small oven-proof bowls so I just used a one big bowl. It worked great. It's very important to remember to cut slits on the dough to let steam out as the pie bakes. Golden brown perfection. We ate like kings and Dan love it and swore he would never go elsewhere for pot pie again. 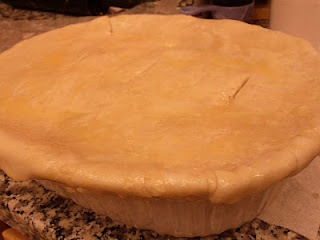 I love pie crust so I made one little variation to Garten's recipe and made a double pie crust. The bottom crust can be easily made by dividing the dough, rolling out one piece of the dough and lining the bottom and sides of the bowl, and then brushing the bottom with egg white wash to prevent a soggy crust. When the filling is ready, pour the filling into the pastry-lined bowl and then roll out the remaining dough to cover the top of the bowl. Pinch edges, cut slits and it's ready to go into the oven. Remember, if you want double pie crust, you'll either need to adjust your number of servings or make more dough.